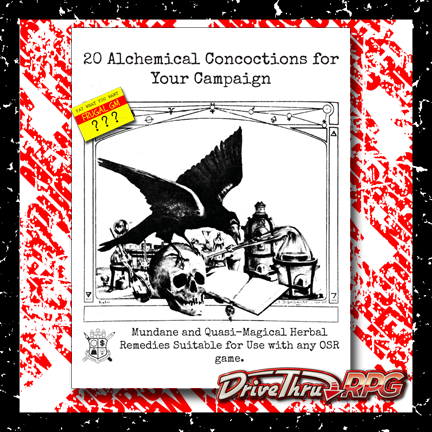 While I've been busy on a new project I decided to take a bit of a break and come up with a selection of 20 Alchemical Concoctions for Your Campaign. It's a bit more than just a list of stuff. I've actually done some real-world research to look up medicinal properties of certain plants and tweaked that information by adding in some fantastical ingredients. Since these are essentially the "poor man's potions" they have a shelf-life and some side-effects as well. I should mention that you might have to do a little bit of work to use these, or at least more than popping off a cork and swallowing it right quick. There is a simple d20 table (like it's hard to count off 20 items in order...) and I even added a drop table at the end. 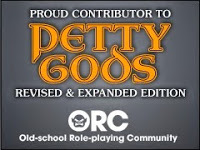 This OSR-generic supplement is available on DriveThruRPG and on my Patreon site as well.